And when it comes to asking questions about Social Security, this guide is just what you need for the curious client who has questions and wants access to important information about their retirement. That's why we've created The Baby Boomer's Guide to Social Security,” a 3-panel, 6 sided, 8.5" x 11", reference guide on Savvy Social Security Planning. This client reference explains the key concepts everyone must consider when making Social Security decisions. 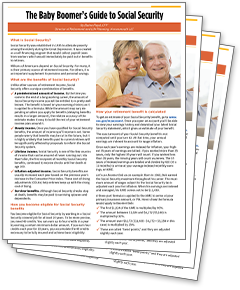 The Baby Boomer's Guide to Social Security is a great, inexpensive handout for clients, prospects and strategic allies. So make sure Baby Boomer's Guide to Social Security is part of your client education and marketing efforts. It's a sound investment in an information product that helps you help clients succeed. You'll see the Baby Boomer's Guide to Social Security meets your highest standards for client materials. Order your client reference handout pack today—that's 50 copies of Baby Boomer's Guide to Social Security for just $197—A 34% savings off the full price. Order Baby Boomer's Guide to Social Security.